Of the 186 countries assessed in a recent survey of climate vulnerability, Chad was rated most in peril . A combination of high poverty, frequent conflicts, and the risk of both droughts and floods means the central African nation is bottom of the list, just below Bangladesh and some way behind Norway, the country least vulnerable to climate change. So why Chad? For a start, it is one of the poorest countries in the world. Around 87% of Chadians are classified as poor, according to the Multidimentional Poverty Index , which factors in health, education and living standards. That’s the fourth highest rate in the world. The percentage who are “destitute” (63%), the most extreme category of poverty, is also the fourth highest in the world. Since the mid-20th century, temperatures in Chad have been increasing while rainfall is decreasing . 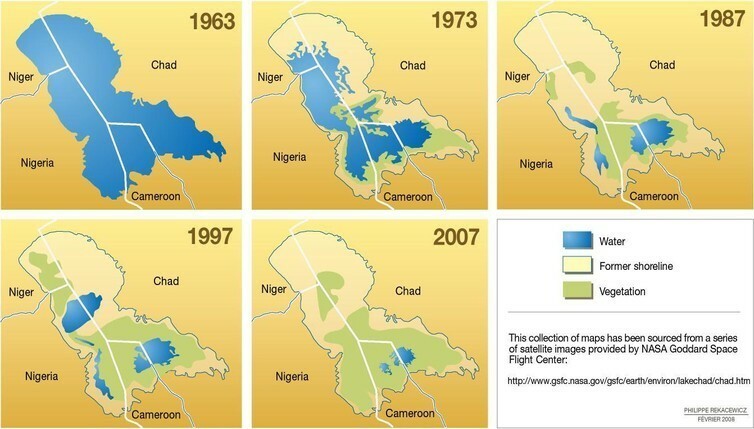 Ninety percent of the country’s largest lake, Lake Chad, has disappeared over the past 50 years due to a combination of droughts and increasing withdrawals for irrigation. Climate studies project things will get increasingly hot and arid throughout the 21st century , which means lower crop yields, worse pasture, and a harder life for anyone dependent on Lake Chad. Rural areas are most at risk from climate change because that’s where most of the population, and most of the poverty, is found. However, urban areas are not safe either, as the country’s growing cities struggle to accommodate the arrival of new residents. Sanitation services like sewage, storm water drainage and waste collection are poor, according to the World Bank . In the event of floods, as happened in 2010 , 2011 and 2012 , the infrastructure cannot cope and untreated sewage could infect the water supply, creating a high risk of infectious diseases such as cholera. Despite these challenges, there are ways to mitigate the effect of climate change. For instance, farmers in Chad’s semi-arid Sahelian zone have been using an indigenous rainwater harvesting technique called Zaï to successfully grow crops . Zaï involves the digging of small pits and sowing crops in them. The pits retain water for a long period of time and are particularly efficient when there isn’t much rain. The Zaï technique was enhanced by introducing manure and compost into the pits to provide nutrients to the crops. This helped rehabilitate soils that are heavily degraded and significantly increased the yields of food crops . Agroforestry, the combining of crops and trees in the same patch of land, can also help mitigate and adapt to the impacts of climate change . Tree roots stabilise soils and protect them from eroding during heavy rainfall, while also restoring fertility simply by producing litter which eventually makes its way back into the earth. Of course, any country would be better placed to deal with climate change if it simply became much wealthier. Chad began producing petroleum in 2003, and it now accounts for 93% of all exports . However, this left the country vulnerable to declines in oil prices. So, when the price did indeed crash in late 2014, Chad suffered a significant loss of revenue. Needless to say, the impact of climate-related disasters such as droughts or floods becomes magnified if the country does not have the resources to combat them.